Trademark types: The new regulation describes in details the different kinds of trademarks, such as: word marks, shape marks, 3D marks, positional marks, pattern marks, color marks and other types of marks. List of goods and/or services: The goods and services for which the protection of the trade mark is sought shall be identified by the applicant with sufficient clarity and precision to enable the competent authorities and economic operators to determine the extent of the protection sought.The general indications included in the class headings of the Nice Classification or other general terms may be used, provided that they comply with the requisite standards of clarity and precision.The use of general terms, including the general indications of the class headings of the Nice Classification, shall be interpreted as including all the goods or services clearly covered by the literal meaning of the indication or term.Goods and services shall not be regarded as being similar to each other on the ground that they appear in the same class under the Nice Classification. Goods and services shall not be regarded as being dissimilar from each other on the ground that they appear in different classes under the Nice Classification. Division of the application: The applicant may divide the application by declaring that some of the goods or services included in the original application will be the subject of one or more divisional applications. A specific application form is filed with the GDIP for such an action. The GDIP shall establish a separate file for each divisional application, which shall consist of a complete copy of the file of the original application, including the declaration of division and the correspondence relating thereto. The Office shall assign a new application number to each divisional application. Disclaimer: When the applicant requests the disclaimer of a non-distinctive element, such a disclaimer will remain in force even in case that the GDIP does not consider it as non-distinctive. Examination based on absolute grounds: The marks will be considered as identical when they are not different at first sight or they distinguish only in irrelevant aspects from each-other.The mark shall not be registered when it is identical with an earlier mark and their goods and/or services ae identical or similar, as well as in case the goods and/or services of a mark are closely related to those of the other mark.In practice, ALPTO will intervene only in case of a high level of similarity between the goods of the identical marks. Such a provision was mainly included to object the registration of trademarks which consist of identical signs for identical or very similar goods/services by protecting the trademark applications filed in bad-faith. Search report: During the examination of trademark application based on absolute grounds, the GDIP draws up a search report listing all the earlier marks or trademark applications which resulted from a search on its database, and on the basis of which, the trademark registration may be opposed according to article 143 of law 9947 (refusal based on relative grounds).The search report includes the filing date, the word elements, the representation of the mark, the owner’s or applicant’s name and the classes of goods and/or services.The said search report will be delivered to the applicant only in case that the latter has requested the Office to draw up a search report at the moment of filing the trademark application and has duly paid the official fee for trademark search report. 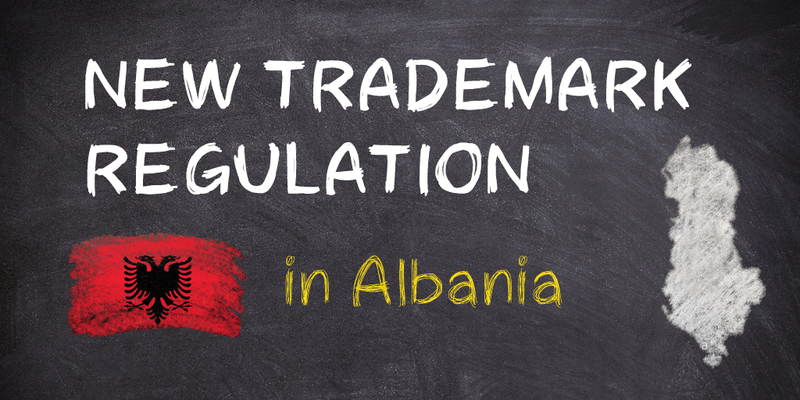 Such a provision is expected to increase the number of oppositions before ALPTO, as well as it will serve to help the proprietors of the earlier marks or trademark applications to be informed about possible trademark applications that may infringe their rights. Opposition: The opposition against a trademark registration shall be filed to the Chamber of Oppositions. The formalities of the opposition can be fulfilled within two months following the receiving date of the official notification. The decision of Chamber of Opposition can be appealed to the Board of Appeals within one month following the receiving date of decision. Re-instatement of rights: The applicant or his representative may request the re-instatement of rights within two months following the removal of the cause for non-compliance, but no later than one year after the expiration of the missed deadline. Recordals of changes in the registry: A single official application form is now used to proceed with all the recordal of changes in the registry, including the change of applicant’s/owner’s name and address, change of ownership, partial change of ownership, recordal of license agreement, recordal of pledge, recordal of bailiff actions, as well as any other change (for example: the recordal of change of the authorized representative).The change of legal form of a company is now possible to be recorded before the GDIP. In such a case, the commercial extract issued from the competent authority for the trade companies is required to be submitted at the GDIP. License agreement: A registered license agreement can be changed/amended or cancelled/revoked. Any change effecting the license agreement shall be registered in the registry. Trademark renewal: The official fine fee for the trademark renewal in grace period is ALL 4000/ 32 EUR. Invalidation/revocation request: The invalidation/revocation request against a registered trademark shall be filed to the Chamber for Invalidation/Revocation. The invalidation/revocation request should be filed along with the necessary documents and argument. Unlike in the case of oppositions, no possibility to fulfill the formalities at a later stage is provided for the request for invalidation/revocation of a registered trademark. The decision of Chamber for Invalidation/Revocation can be appealed to the Board of Appeals within one month following the receiving date of decision. The official notification on refusal of the trademark application: Any notification which is issued during the examination process may be appealed to the Chamber for Invalidation/Revocation within one month following the receiving date of decision. Well-known marks: The well-known status of a mark will be determined by the competent authority, along with the other claims in court or before ALPTO. The new trademark regulation defines the meaning of “the competent authority” as the administrative or judicial authority which is competent to determine if a mark is well-known.The criteria for determining the well-known status of a mark are the same as those listed in the WIPO Joint Recommendation Concerning Provisions on the Protection of Well-Known Marks.